Using services offered by www.batterybhai.com means you accept service terms and conditions of the organization. So, we request you to read our terms and conditions very carefully before using our service. Subscribing to or using services offered by BatteryBhai, means you have read, understood and are bound by the terms (it doesn’t matter how you have subscribe or used our service). If you do not agree or don’t want to be bound by the terms and conditions, then you are suggested not to subscribe to or use our services. In these terms, “you” or “User” means the end users, who are accessing the website of BatteryBhai, its contents and using the Services offered through the Website; “Service Providers” referred to third party service providers and “We”, “Us” and “Our” means BatteryBhai.com and its affiliates. www.batterybhai.com ("Website") is an Internet based e-commerce and content website owned and operated by WGM Media Services Private Limited, an organization established under the laws of India. You can use the website after accepting conditions without modification of all the terms, conditions and notices restricted in these Terms, as may be posted on the website of Batterybhai.com on different time periods. www.batterybhai.com at its discretion reserves the right not to accept a user from registering on its portal without assigning any reason thereof. You have to agree and undertake not to reverse engineer, change copy, distribute, transmit, exhibit, execute, reproduce, publish, license, create copied works from, transmit, or sell any information or software acquired from the Website. Limited copying or reproducing of the contents of the website is permitted, if BatteryBhai’s name is declared as the source and our advance written permission is asked. To eliminate any doubt, it is clarified that boundless or wholesale reproduction and copying of the content of the website for commercial or non-commercial reasons and unnecessary amendment of data and information within the content of the Website is not allowed. The Website is a platform that Users utilize to meet and interact with one another for their transactions. BatteryBhai is not and cannot be a party to or control in any manner any transaction between the Website's Users. 1. All commercial/contractual terms are offered by and agreed to between Buyers and Sellers alone. The commercial/contractual terms include without limitation price, shipping costs, payment methods, payment terms, date, period and mode of delivery, warranties related to products and services and after sales services related to products and services. BatteryBhai does not have any control or does not determine or advise or in any way involve itself in the offering or acceptance of such commercial/contractual terms between the Buyers and Sellers. 2. BatteryBhai does not make any representation or Warranty as to specifics (such as quality, value, salability, etc) of the products or services proposed to be sold or offered to be sold or purchased on the Website. BatteryBhai does not implicitly or explicitly support or endorse the sale or purchase of any products or services on the Website. BatteryBhai accepts no liability for any errors or omissions, whether on behalf of itself or third parties. 3. BatteryBhai is not responsible for any non-performance or breach of any contract entered into between Buyers and Sellers. BatteryBhai cannot and does not guarantee that the concerned Buyers and/or Sellers will perform any transaction concluded on the Website. BatteryBhai shall not and is not required to mediate or resolve any dispute or disagreement between Buyers and Sellers. 4. BatteryBhai does not make any representation or warranty as to the item-specifics (such as legal title, creditworthiness, identity, etc) of any of its Users. You are advised to independently verify the bona fides of any particular User that You choose to deal with on the Website and use Your best judgment in that behalf. 5. BatteryBhai does not at any point of time during any transaction between Buyer and Seller on the Website come into or take possession of any of the products or services offered by Seller nor does it at any point gain title to or have any rights or claims over the products or services offered by Seller to Buyer. 6. At no time shall BatteryBhai hold any right, title or interest over the products nor shall BatteryBhai have any obligations or liabilities in respect of such contract entered into between Buyers and Sellers. BatteryBhai is not responsible for unsatisfactory or delayed performance of services or damages or delays as a result of products which are out of stock, unavailable or back ordered. 7. The Website is only a platform that can be utilized by Users to reach a larger base to buy and sell products or services. BatteryBhai is only providing a platform for communication and it is agreed that the contract for sale of any of the products or services shall be a strictly bipartite contract between the Seller and the Buyer. At no time shall BatteryBhai hold any any right, title or interest over the products nor shall BatteryBhai have any obligations or liabilities in respect of such contract. BatteryBhai is not responsible for unsatisfactory or delayed performance of services or damages or delays as a result of products which are out of stock, unavailable or back ordered. 9. You release and indemnify BatteryBhai and/or any of its officers and representatives from any cost, damage, liability or other consequence of any of the actions of the Users of the Website and specifically waive any claims that you may have in this behalf under any applicable law. Notwithstanding its reasonable efforts in that behalf, BatteryBhai cannot take responsibility or control the information provided by other Users which is made available on the Website. You may find other User's information to be offensive, harmful, inconsistent, inaccurate, or deceptive. Please use caution and practice safe trading when using the Website. Please note that there could be risks in dealing with underage persons or people acting under false pretence. www.batterybhai.com reserves all rights to disclose any information (including, but not limited to the identity of the individuals, who are engaged in providing information or materials on the Website) as necessary to satisfy any law, regulation or valid request of the government. We may disclose information to help in investigation of any alleged illegal activity or solicitation of any illegal activity or in response to a lawful court order or subpoena in this regards. BatteryBhai can (and you hereby expressly authorize us to) also disclose any kind of information regarding you to law enforcement or other governmental officials, as we, in our sole discretion , believe important or suitable in connection with the investigation and/or resolution of possible crimes, especially those that may involve personal injury. Despite these rights of BatteryBhai, YOU WILL BE COMPLETELY RESPONSIBLE FOR THE CONTENTS OF EVERY MATERIAL YOU POST IN THE PUBLIC AREAS OF OUR WEBSITE AND ALSO IN YOUR PRIVATE MESSAGES. Messages posted on the website don’t inevitably represent the views of BatteryBhai. In no events or accidentally BatteryBhai assume or have any kind of accountability or legal responsibility for contents posted or for any declaration, damages or losses resulting from use of product or content and/or appearance of content on the Website or product we offer. Therefore, you hereby differentiate and warrant that you have all essential rights in and to every contents you offer and information it carries and such things shall not violate any proprietary or other rights of third parties or contain any offensive, convoluted, or otherwise illegal information. Your connection or business contract with, or contribution in endorsement of, advertisers found on or through the websites, which may include payment and delivery of related goods or services offered by us, and any other Terms & Conditions, warranties or symbolizations associated with such transactions, are exclusively between you and such advertiser. BatteryBhai shall not be accountable or answerable for any loss or damage of any sort acquired as the result of any such dealings or as the result of the presence of such advertisers on the Website. BatteryBhai does not approve of such unauthorized uses but by using the Websites you acknowledge and agree that www.batterybhai.com is not responsible for the use of any personal information that you publicly disclose or share with others on the Websites. Please carefully select the type of information that you publicly disclose or share with others on the Websites. BatteryBhai reserves rights to take required action and we can claim damages that may take place due to your connection/involvement in any way on your own or through group/s of People, intentionally or unintentionally in DoS/DDoS (Distributed Denial of Services). You, as the user of the website have to guarantee, and certify that you are the owner of the content, which you have submitted or otherwise certified to use the content and the content does not break upon the property rights, intellectual property rights or other rights of others. You further warrant that to your knowledge, no action, suit, proceeding, or investigation has been instituted or threatened relating to any content, including trademark, trade name service mark, and copyright formerly or currently used by you in connection with the Services rendered by BatteryBhai. www.batterybhai.com hereby denies the guarantee of exactness (e.g. appearance and finish) of the final product ordered by you. Quality of any product or service purchased or obtained by user of the website may not meet their expectations. Unless or else specified or anything limited to the contrary or any proprietary material owned by a third party and so expressly mentioned, www.batterybhai.com owns all Intellectual Property Rights to and into the Website, including, without limitation, any and all rights, title and interest in and to patents, copyright, related rights, trade names, utility models, service marks, trademarks, know-how, designs, trade secrets and inventions (whether patentable or not), source code, goodwill, databases, meta tags, text, content, icons, graphics and hyperlinks. You admit and agree that you shall not use, copy or distribute any content from the website, which belongs to www.batterybhai.com without obtaining approval from the company. We hereby clarifying that you will be owner and shall solely be responsible for any type of content (text, data, information, images, photographs, or any other material) you provide or upload while using any service, which you may upload, transmit or store when making use of our various Service. The website of BatteryBhai may contain links to other websites (“Linked Sites”). The Linked Website are not under the control of BatteryBhai and we are not responsible for the contents of any linked websites, including without limitation any link contained in a linked website, or any change or update to the Linked Website. We are not responsible for any form of transmission, whatsoever, received by the user from any Linked Website. We are providing these links to the users only as a convenience, and inclusion of these links does not imply endorsement by us or the Website of the Linked Sites or any connection with its operators or owners including the legal heirs or assigns thereof. You are requested to verify the accuracy of all information before undertaking any dependence on such information. www.batterybhai.com has attempted to ensure that all information provided on its website is correct, but BatteryBhai neither warrant nor make illustration regarding the quality, exactness or wholeness of any data, information, product or Service. In no event shall we be liable for any direct, indirect, punitive, incidental, special, consequential damages or any other damages resulting from: (a) the use or the failure to use the Services; (b) illegal access to or change of the user's transmissions or data; (c) any other matter relating to the services; including, without limitation, damages for loss of use, data or profits, arising out of or in any way connected with the use or performance of the Website or Service. Neither shall BatteryBhai be accountable for the delay or incapability to use the Website or related services, the condition of or failure to provide Services, or for any information, products, services and related graphics obtained through the Website, or otherwise happening out of the use of the website, whether based on contract, tort, carelessness, strict liability or otherwise. Further, we shall not be held answerable for non-availability of the Website during periodic maintenance operations or any accidental suspension of access to the website that may occur due to technical reasons or for any reason beyond our control. You have to understand and agree that any material and/or data downloaded or otherwise obtained through the Website is done entirely at your own discretion and risk and you will be solely responsible for any damage to your computer systems or loss of data that results from the download of such material and/or data. Users agrees to indemnify, defend and hold harmless BatteryBhai from and against any and all losses, liabilities, claims, damages, costs and expenses (including legal fees and disbursements in connection therewith and interest chargeable thereon) asserted against or incurred by BatteryBhai that arise out of, result from, or may be payable by virtue of, any breach or non-performance of any representation, warranty, covenant or agreement made or obligation to be performed by them in accordance with these Terms. Batterybhai.com shall not be held liable for any damaged goods or any injuries resulting from use of any products. We do not provide warranties on any battery (ies). Manufacturer of the battery (ies) is/are solely liable for any promises and warranty made on the battery. The information regarding batteries, we provide to our customer, is limited to the information collected from the public domain and third parties. All displayed batteries in our catalogue may not be available for sale due to unavailability of the battery or any other reasons. Actual color and dimension of the battery may differ from the screen image. BatteryBhai.com tries to be as accurate as possible. 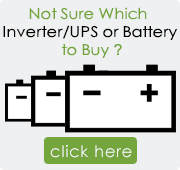 However, BatteryBhai.com does not warrant that product description or other content of this site is accurate, complete, reliable, current, or error-free. If a product offered by BatteryBhai.com itself is not as described, your sole remedy is to return it in unused condition. Pricing on the product is as it shows, however due to any technical issue, typographical error or product information received from our suppliers, prices of the product may vary. Batterybhai.com will try to be accurate, however in the event that a product is listed at an incorrect price or with incorrect information due to an error in pricing or product information, Batterybhai.com shall have the right, at our sole discretion, to refuse or cancel any orders placed for that product, unless the product has already been dispatched. In the event that an item is incorrectly priced, Batterybhai.com may, at its discretion, either contact you for instructions or cancel your order and notify you of such cancellation. Unless the product ordered by you has been dispatched, your offer will not be deemed accepted and Batterybhai.com will have the right to modify the price of the product and contact you for further instructions using the e-mail address/phone no. provided by you during the time of registration, or cancel the order and notify you of such cancellation. We strive to provide you with best value, however prices and availability are subject to change without notice. Please note that if the old battery returned is of local make or not of similar and known brands listed in our website. The OBR is subject to lesser discount and it shall be awarded only after the inspection by delivery team and verification of the total weight of the old battery returend by customer. *However due to fluctuation in International market rates of the metal 'Lead' as a commodity and the local rates offered by the 'Smelters', OBR offered or listed in website may also change accordingly. Batterybhai.com reserves the right to cancel any order without any explanation for doing so, under situation where Batterybhai.com is not able to meet the requirement of the order placed or order so placed/cancelled does not comply with the Batterybhai.com policy or for any other reason. However, Batterybhai.com will ensure that any communication of cancellation of an order, so cancelled, is intimated within appropriate time to the concerned person and any applicable refund, will be made in reasonable time. You agree to defend, indemnify and hold harmless Batterybhai.com, its employees, directors, officers, agents and their successors and assigns from and against any and all claims, liabilities, damages, losses, costs and expenses, including attorney's fees, caused by or arising out of claims based upon your actions or inactions, which may result in any loss or liability to Batterybhai.com or any third party including but not limited to breach of any warranties, representations or undertakings or in relation to the non-fulfillment of any of your obligations under this User Agreement or arising out of your violation of any applicable laws, regulations including but not limited to Intellectual Property Rights, payment of statutory dues and taxes, claim of libel, defamation, violation of rights of privacy or publicity, loss of service by other subscribers and infringement of intellectual property or other rights. This clause shall survive the expiry or termination of this User Agreement. This User Agreement is effective unless and until terminated by either you or Batterybhai.com. You may terminate this User Agreement at any time by informing us in writing through Indian postal system by registered post, that you no longer wish to be associated with this website, provided that you discontinue any further use of this Website. Batterybhai.com may terminate this User Agreement at any time and may do so immediately without notice, and accordingly deny you access to the Website. Such termination will be without any liability to Batterybhai.com. Upon any termination of the User Agreement by either you or Batterybhai.com, you must promptly destroy all materials downloaded or otherwise obtained from this Website, as well as all copies of such materials, whether made under the User Agreement or otherwise. Batterybhai.com’s right to any Comments shall survive any termination of this User Agreement. Any such termination of the User Agreement shall not cancel your obligation to pay for the product already ordered from the Website or affect any liability that may have arisen under the User Agreement. BatteryBhai reserves all rights to suspend or terminate your use of the Website or any Service if we believe, in our sole and absolute discretion that you have violated a term of these Terms. If you or www.batterybhai.com may terminate your use of the Website or any Service, we may remove any content or other objects relating to your use of the Service and we shall have no liability to the user or any third party for doing so.